January 27, 2019 By Leroy Thompson & filed under All Articles, Long Guns, Tactics/Training. Rock River LAR-PPS/PDS. With AR-15-based pistols, it is sometimes more difficult to hit the bolt release with the palm, as the weapon is less stable. Last month in this space, I wrote about the trend of using rifle-caliber pistols with arm braces. I pointed out their advantages and tactical uses. In this column, I want to discuss the same type of pistol but without the arm brace. I’ve tested a half dozen of these rifle-caliber pistols, shooting them as if they were a typical handgun and adapting how I shot them to fit their greater weight, recoil, and overall length. For the most part, I’ve decided that using these pistols accurately at a distance past 25 yards is difficult without a great deal of practice or use of a rest. So why would someone use a 5.56x45mm/.223 pistol or one in 7.62x59mm or .30 Carbine without the arm brace? There are advantages to a compact weapon chambered for a rifle cartridge. It is handy to use in a confined space such as a vehicle, yet gives the striking power and penetration of a rifle cartridge. Penetration can be important if engaging in combat around vehicles where an attacker might have taken cover. The rifle-caliber pistol will also take a higher capacity magazine than most standard pistols. Because of their weight, many AR-15-based pistols are relatively controllable firing with one hand, but better with two hands. Firing Inland .30 Carbine pistol in standard pistol fashion is possible. 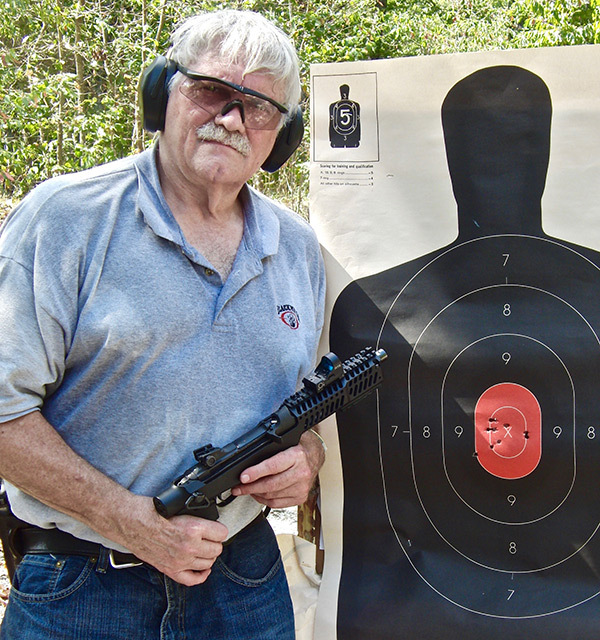 Red dot aids accuracy, but Thompson found pistol too barrel heavy for precise shot placement. Normally, though, a standard 9x19mm or .45 ACP pistol fired with a two-hand hold will be more accurate at the same distance, especially at 25 yards or more. At 50 yards, I can shoot a better group offhand with my SIG P210 than with the rifle-caliber pistols I’ve tried. Having good arm and hand strength helps in firing the rifle-caliber pistol, as most I’ve fired are barrel heavy, especially if they have a forearm with rails. Placing a support hand on the forearm helps in controlling the pistol and with practice aiming it. 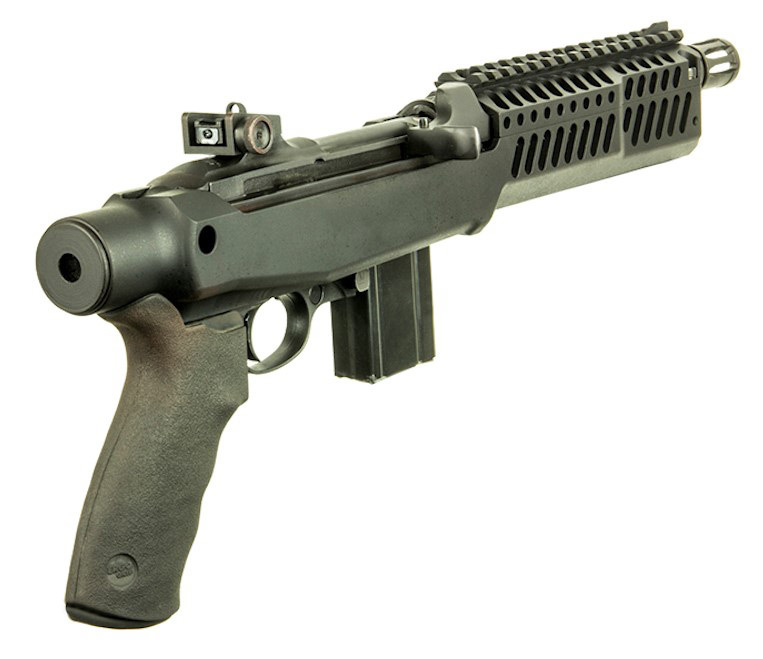 Adding a vertical foregrip is illegal with a rifle-caliber pistol. I’ve fired the HK MP5K original version that did not have a stock but had a vertical foregrip, and found the foregrip did help, but it was still hard to control. Admittedly, I was firing bursts, but it was a 9x19mm as opposed to a 5.56x45mm weapon. Trijicon RMR or other compact red dot aids accuracy with rifle-caliber pistol such as LAR-PPS/PDS. 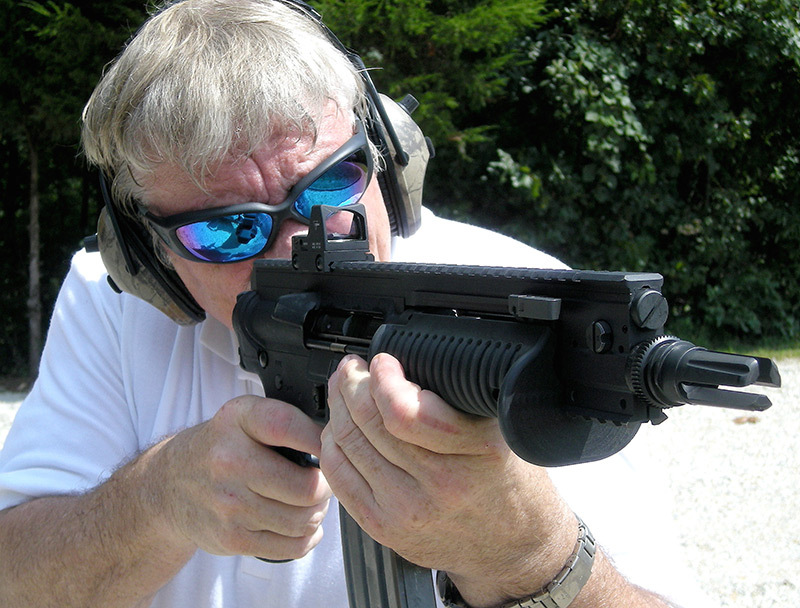 My experience has been that a red dot sight helps when firing a rifle-caliber pistol. 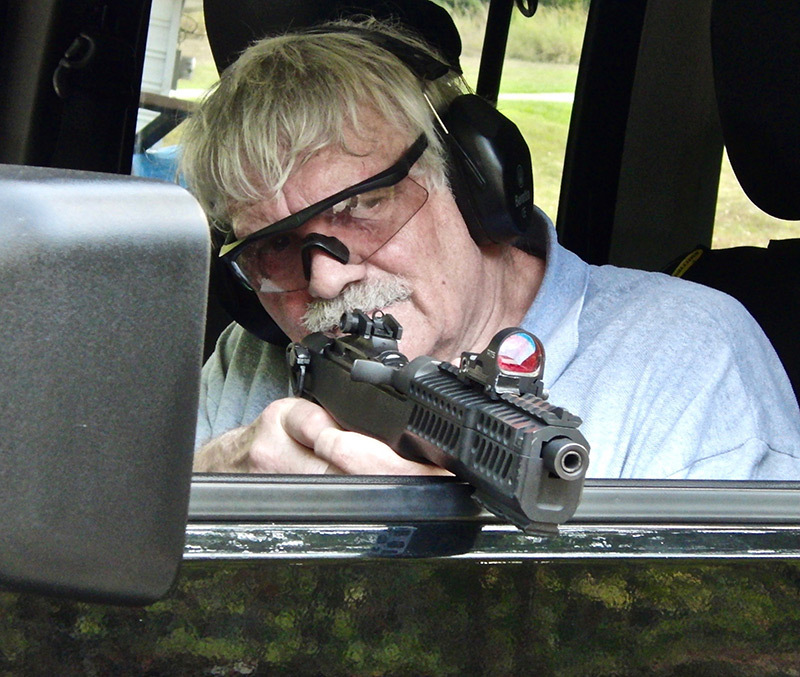 The longer, heavier barrel on rifle-caliber pistols makes acquiring iron sights more difficult for me, while I find I can place a red dot on the target and hold it steady enough to fire accurately. When using a two-hand hold with the rifle-caliber pistol, great care must be taken that the support hand does not stray in front of the muzzle. Some of the pistols have a hand stop of some type to prevent this. I have also found that when using a two-hand hold, it works best to push the pistol back against the shooting hand’s palm. When firing multiple shots quickly, I slide my support hand back to just in front of the magazine well to give the weapon more support. Another technique used by some is to mount a sling to the swivels on the butts of some of the rifle-caliber pistols, then push the pistol forward against the sling to stabilize it. I’ve seen this method used successfully, but it has not been especially effective for me. Using support hand to push/pull back against hand grasping pistol grip can offer some stability for shooting rifle-caliber pistol. Chambering a round and operating the bolt release require some adjustment with the rifle-caliber pistol. 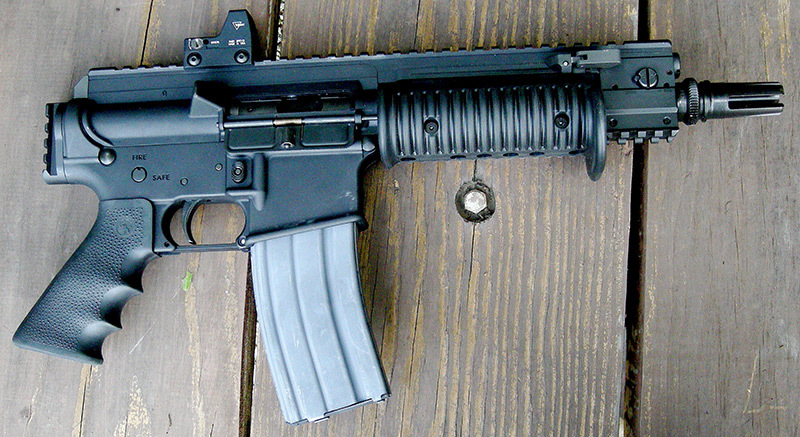 The same techniques of pulling back the charging handle on an AR-15 or slapping the bolt release with the palm of the hand will work on a pistol based on the rifle. But we are used to having the stock braced against our shoulder when carrying out these operations. I find that slapping the bolt release sometimes moves my hand carrying the pistol, thus keeping the palm from hitting hard enough to release the bolt. Normally, I release the bolt by pulling back on the cocking handle anyway, so I use this technique with the AR-15-based pistol. For chambering the first round or releasing the bolt after a mag change, the shooting hand must grip the AR-15-based pistol tightly when operating the bolt. 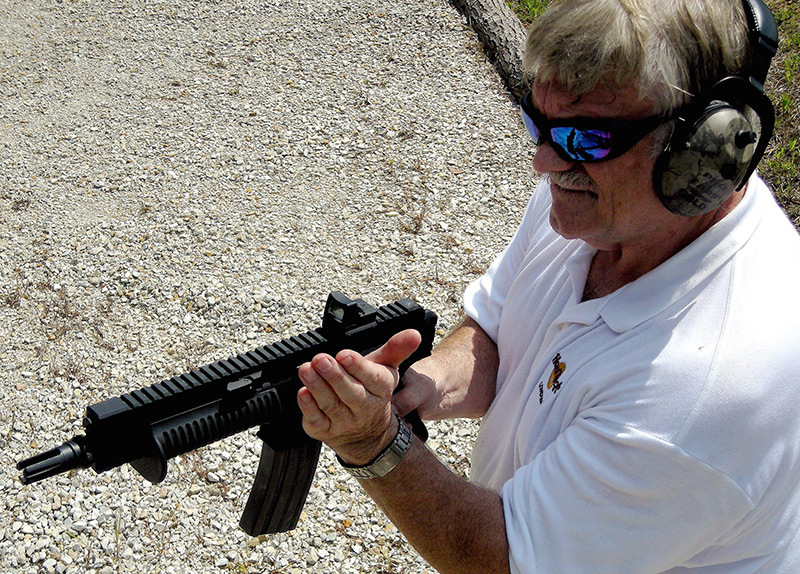 I have tried shooting the rifle-caliber pistol in the style used to fire SMGs from the hip. By bracing the elbow of my shooting hand against my side and gripping the forearm tightly, I can point and shoot effectively at 10 to 15 yards. Good shot placement is possible at ten yards when bracing Inland .30 Carbine pistol on vehicle window edge. As I mentioned earlier, the best accuracy I’ve achieved with the rifle-caliber pistol is firing it from a rest. I’ve shot good groups at 25 yards and acceptable groups on silhouette targets at 50 yards using some type of rest. This can be an improvised rest such as the top of a barrier. Since I view the rifle-caliber pistol as a weapon suitable for close-range counter-assault usage, I have also practiced with it from within a vehicle with the pistol resting on the window ledge. In close-range counter-carjack scenarios, it puts a lot of rifle bullets center mass on a silhouette target quickly. I’m sure some who are reading this have a rifle-caliber pistol with which you have practiced a lot and can shoot well. Kudos to you! In my case, I normally shoot more accurately at ranges of 25 yards or more with one of my better combat pistols and certainly with a rifle. I practice taking hostage-taker headshots with pistols at 25 yards and rifles at 50 yards or more. .30 Carbine caliber pistols from Inland have advantage of less recoil, allowing better control, but are also longer and make it harder to balance them when shooting. They work best from a rest, such as a vehicle window ledge. Although I’ve tried shooting this type of target with a rifle-caliber pistol, I don’t do as well and don’t have the confidence I do with other weapons. However, I have shot these drills at 50 yards with my Springfield Armory SAINT with arm brace and am very confident with it. I to some extent equate the rifle-caliber pistol with the shotgun. Past 25 yards, I can shoot a “pattern” with it, but that pattern consists of hits with a faster, heavier projectile than a 00 Buck pellet. Compact weapons that fire rifle-caliber cartridges are extremely useful weapons. I’m a big fan of the HK53, Colt Commando, and AKSU. But each of those carbines has a stock. As long as arm braces are available for rifle-caliber pistols, I don’t see an argument in favor of not using them unless prohibited by local laws.